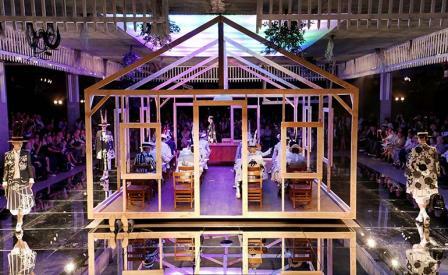 Scene setting: Thom Browne whisked us away to a topsy-turvy world, by way of a twisted schoolhouse (complete with a front garden on the ceiling) that had landed on some poor Thom Browne-clad soul (a pair of legs and shoes were visible unsquashed underneath). Haunting music gave the arrangement of school desks, each primed with notebook and pencil, an even more foreboding quality. And as the procession of schoolgirl/models appeared wearing braided pigtails that stood on end through their Stephen Jones straw boater hats, the fairy-tale gone wrong developed in full swing. Mood board: Browne’s classic suits were emblazoned kimono-style with Japanese motifs such as oversized flowers, cherry blossom branches, willow leaves and even abstracted portraits of geishas, in a myriad of textures and colours. Below-the-knee, box-pleated skirts played up the schoolgirl feel while also resembling samurai armour, and iridescent appliqué and pastel coloured furs infused the pieces with a naive, but elevated vibe. Best in show: The closing series of looks, which were predominantly realised in stark black and white, possessed an incredibly graphic quality that gave the models’ Japanese/Charlie Chaplin make-up a renewed artistic quality. Browne’s ability to combine apparently disparate sources of inspirations that somehow make natural sense in his world is something to be truly commended and admired.